I hope you enjoy this one as much as I had making it. Hehe, I have to say it was fun coming up with something for this. I was going through my office and ran across this stamp. The stamp is part of a set, but I just laughed at the saying on it, "hit me, cupid!" I knew I had to make something good from it. I plan on using the other stamps that are in this set as well. I am busy here in my little pad of an office. I need to give it a different name other than "office" ~ that just seems too formal. I need something light and fun. Any ideas??? 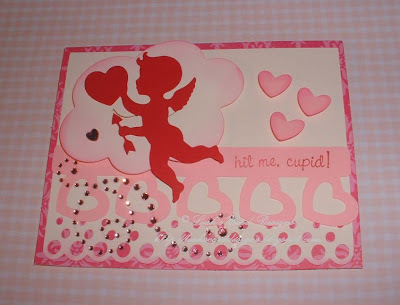 I should add in there above that this card was part of My Pink Stamper Challenge. Robyn had a fun blog hop and boy was it fun. We had to follow to get all the keywords and make a project and this is what I came up with. I hope to get more done today. I have my little one home today. He's not feeling well. Hoping to get him well on his way to school tomorrow. I just hate when the little ones aren't feeling well. I have him resting now hence I'm in here crafting at the moment. I have the monitor going so I can hear if he needs me. I just love that monitor. Hehe, not just for babies aye! I still use his only because when my Grandad did our house he really insulated it well and when you yell from upstairs you cannot hear downstairs. I use the monitor then he doesn't have to yell for me and his request is heard and taken care of in a timely manner. Thank you for stopping by. Feel free to leave a comment. I read them all and I will respond either by personal email back to you or leave a comment here for you. Have a wonderful day! Bye for now! Really cute card love the stamp TFS. Leah, this card is very cute. It really caught my eye when I was looking at all the items that have been submitted. Yours caught my eye because I have twin girls born on Valentine's Day . I understand what you mean when the little ones are not feeling well. My "baby boy" is almost 13 and he has Muscular Dystrophy. I worry about him all the time because his room is on the lower level and we are up 2 flights. Thanks for sharing... I have become a follower on your blog.